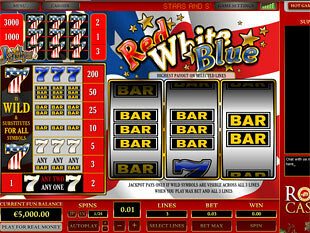 Red White Blue 3 Lines Slots is gorgeous classic game powered by Top Game. The main advantage of this slot is progressive jackpot that you can, win if you play for high stakes. Moreover, you can also win top jackpot of 3,000 coins or $15,000. So, hurry up to stake on and make your free time as exciting as possible. This game exists in no download format, so you don’t need to install software on the lap top. Thanks to stylish design and high quality graphics it is really absorbing to follow the game symbols spinning: Triple Bar, Double Bar, Single Bar, White Seven and Blue Seven. Special game symbol is American Seven. As there are a lot of coin denominations to choose from, you can easily vary the stakes and choose bets depending on your account state: $0.01, $0.02, $0.05, $0.10, $0.25, $0.50, $1.00, $3.00, $5.00. The minimum bet is $0.01, if your coin denomination is minimum and you play with one line. The maximum one is $15.00, on condition that the coin denomination is maximum and you play with 3 lines. The highest red white blue jackpot is 3,000 coins or $15,000 for 3 American Sevens on the second line. The second red white blue jackpot is 1,000 coins or $5,000 for 3 American Sevens on the first line. 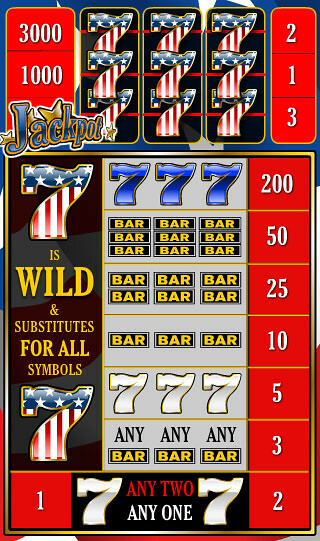 The third red white blue jackpot is 200 coins or $1,000 for 3 Blue Sevens on any line. The role of wild symbol is played by American Seven. This symbol is the key symbol as it can act as a substitute and can replace lacking symbols to complete the winning combination. Only this icon can help you to win really considerable prizes. Progressive jackpot can be won only on condition that you play with maximum bet. So, choose the maximum bet and catch the winning combination consisting of 3 American Sevens and progressive jackpot is guaranteed.